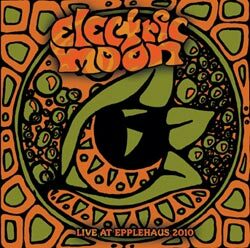 Electric Moon - "Live at Epplehaus 2010"
Electric Moon is Dave’s (Sula Bassana) new band with his girlfriend Lulu on bass. They have released on album on Nasoni and soon have a 2nd one coming out. This live show features one track on each CD. The first CD is a new piece (jam) called Demoon that lasts for 46 minutes and has a lot of experimentation going on. The next track is Doomsday Machine and this has one of the heaviest riffs that Dave has ever come up with on a guitar and reminds me a bit of the band going into a White Hills kind of direction but with fewer effects on the guitar and a more clean production. I am not sure what this set costs but I think they only made 100 copies. Pretty cool. If you like Sula and want to hear him really stretch out on the guitar then this is a must have.